What little boy (or girl for that matter) doesn’t want to be a super hero? Well Everything Your MamaMade and More has come up with a great solution! The little superhero costume set has a great variety of sizes for kids from 3 months old to size 10 and even a doll size. I made size 4-5 for my not-so-little guy and he loves it! I managed to source everything from my stash. The outside of the cape is made from black poly-cotton and I used some leftover cotton jersey for the applique. Green is the colour of choice from the boys in my house, so there was never any doubt that green would be the feature. For the lining, I chose some green flame print satin, a remanent bin find from earlier this year. What better for a super hero? Choosing the applique was a little more challenging… there were so many options! In the end I settled on the rocket as space rockets are one of his favourites. All of the pieces came together quickly and the fit is just right, although I did add use 2” pieces of Velcro on the neck pieces for extra adjustability. He may be tall, but he is still only 2. There are several mask options available, but unfortunatley the little man would not wear his! 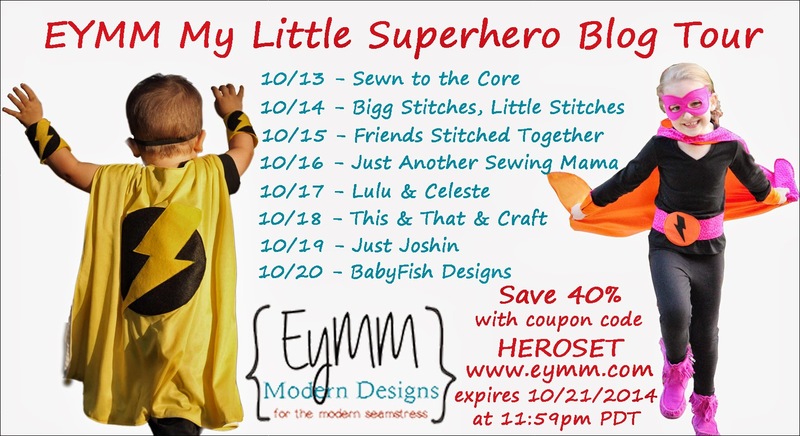 The My Little Superhero set is now available on the EYMM website. Use discount code HEROSET for 40% off (only $2.97, rather than full price $4.95), until 11:59pm Pacific Time on Oct. 21. He looks like he's having so much fun!!!! Thanks! He certainly was having a lot of fun! Looking good! Did he save the world today?